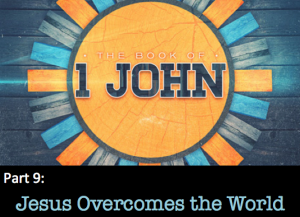 For the last 2 weeks, John has been warning his readers about the world– a way of living in rebellion against God and his truth. It is a place filled with temptation and deception that can distract and confuse every one of us. Yet John wants us to have joy and hope in the midst of this. How is that possible? We will hear the answer this Sunday. To prepare, read 1 John 2:28-3:10. On Wednesday, September 21, we will gather in the Fellowship Hall (where we meet on Sunday) for a Night of Worship and Praise. We will begin at 7:00pm and have a time of focusing and reflecting on our awesome God. We will begin our next Bible Study time and Wednesday September 28 from 7pm-8:30pm. We will be meeting at the Haupt’s house located in Laurel Cove at 1317 Conrad Lane. 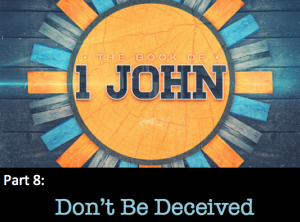 In 1 John 2:18-29, John is going to warn us not to be deceived by the people of the world. This is an important topic in our culture today. Each of us is bombarded by so much information and so many opinions it can be difficult to identify and follow the truth. It was the same in John’s time. So, how can we prevent being deceived by these different voices we hear every day? That’s what John we teach us this Sunday. To prepare, read 1 John 2:18-29 and see if you can discover some of his secrets to a firm and unshakable faith.